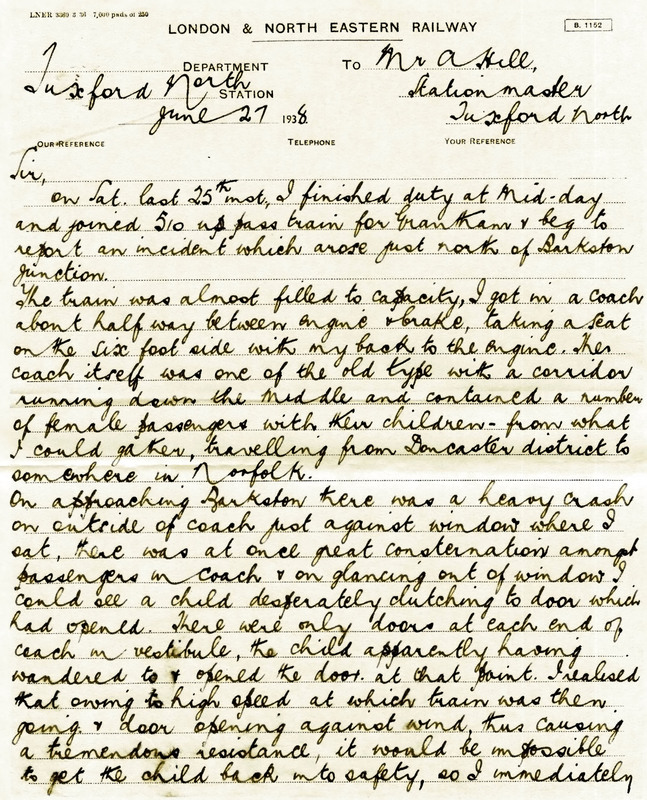 Tony Gostick has kindly sent in a two-page letter which Herbert Meade, a clerk at Tuxford North station sent to his boss, the Stationmaster in 1938. 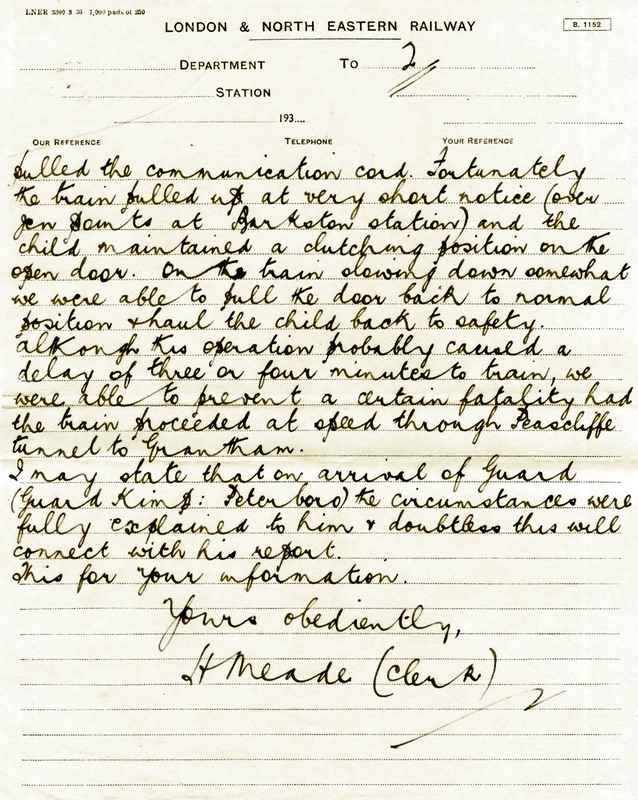 In the letter Meade explains why he pulled the communication cord on his homeward journey to Grantham the previous Saturday, almost certainly saving the life of a child pasenger. Herbert Meade, an uncle of Tony's wife, started on the railway as a temporary Goods Clerk in 1925. He worked through the General Strike and afterwards was finished, but he was re-employed by the railway two years later. He worked at various stations as a Clerk including Ancaster, Rauceby, Scunthorpe and Tuxford North. Eventuallly he became a Clerk in the Ticket Office at Grantham for many years until the late 1970s. The letter is handwritten on an LNER internal memorandum pad . We are including both a reproduction of the letter in its admirable script and, beneath it, a transcription. On Saturday last 25th June I finished duty at Mid-day and joined 510 up passenger train for Grantham. I beg to report an incident which arose just north of Barkston Junction. The train was almost filled to capacity. I got in a coach about halfway between the engine and brake, taking a seat on the six foot side with my back to the engine. The coach itself was one of the old type with a corridor running down the middle and contained a number of female passengers with their children - from what I could gather travelling from Doncaster district to somewhere in Norfolk. On approaching Barkston there was a heavy crash on the outside of the coach just against the window where I sat. There was at once great consternation amongst the passengers in the coach and on glancing out of the window I could see a child desperately clutching to a door which had opened. There were only doors at each end of the coach, in the vestibules, the child having apparently wandered to and opened the door at that point. I realised that owing to the high speed at which the train was then going and the door opening against the wind, causing tremendous resistance, it would be impossible to get the child back into safety, so I immediately pulled the communication cord. Fortunately the train pulled up at very short notice (over the junction points at Barkston station) and the child maintained a clutching position on the open door. On the train slowing down somewhat we were able to pull the door back to the normal position and haul the child back to safety. Although this operation probably caused a delay of three or four minutes to the train, we were able to prevent a certain fatality had the train proceeded at speed through Peascliffe tunnel to Grantham. I may state that on the arrival of the Guard (Guard Kimp, Peterboro) the circumstances were fully explained to him and doubtless this will connect with his report. Herbert Meade acted promptly and bravely to save the child. On his next day at work he sat down to explain, in a formal letter to his employer, his action in stopping their train, including an acknowledgement that this may have caused a delay - he would be very well aware how important was timekeeping to a railway manager. The letter may be the only record we now have to remind us how close to death an unknown child came on an ordinary railway journey. We can only imagine what might have happened that day had someones as quick-thinking as Herbert Meade not been at hand to deal with the incident.